Cookie Monster and Elmo cookies are so adorable we can't contain ourselves! 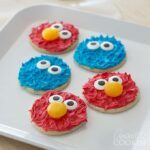 Perfect for a Sesame Street, Elmo or Cookie Monster birthday party too! First you need to make your sugar cookies and let them cool. While the cookies are cooling you'll tint your frostings. Separate the white frosting into two bowls. Use a toothpick or a butter knife to lift a small amount (less than an 1/8 teaspoon) of gel food coloring out and add it to one of the bowls of frosting. This is all experimentation. Mix it all together and add more if needed to reach the desired color. Repeat for the second color. To decorate your Cookie Monster and Elmo cookies and make the frosting look like that fun muppet hair we all know and love, first spread some colored frosting on the sugar cookie. Next simply touch the frosting with the butter knife and pull upward. Keep doing this over and over until you are happy with the results. It's not much more complicated than that! All that's left to do is add two jumbo candy eyes. To look like Cookie Monster, make sure you position the eyes so they look jumbled or cross-eyed. For Elmo, add a butterscotch disc for the nose. Please don’t use liquid food coloring. This will make your frosting too thin and you will not get the vibrant color you need. You WILL throw it away and be disappointed. Only use gel food coloring. You will likely have extra frosting left over. This recipe for Cookie Monster and Elmo Cookies was printed from AmandasCookin.com - https://amandascookin.com/cookie-monster-elmo-cookies/ and can only be printed for education or personal use.